During the past two days, I was very fortunate to work for Kumu Hula Leina'ala who had a Hula workshop for 18 students from Japan. Kumu took us to Kawaikini School for its May Day, Waimea Canyon, Kalalau Lookout, Hanalei Beach and Ke ahu a laka Heiau where Hula was believed to be born. I thought I was the luckiest man....to be an interpreter because I was able to go sightseeing at amazing sites together with many ladies. Especially since I love watching hula, I appreciated watching hula lesson, including amazing chant by Kumu. 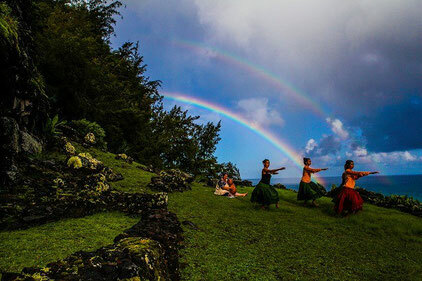 I also enjoyed taking photos of hula and beautiful sceneries of Kauai. But that was not all. The best part of being interpreter is "learning." In order to translate what Kumu said in English into Japanese, I need to understand it. There were many things I first knew through my understanding of the translation. The more translation I do, the more chances of understanding I get. Indeed, I learned a lot about Hawaiian nature, culture, and the island of Kauai from Kumu Leina'ala. Now I am busier for editing huge amount of digital memories of photos and some videos I took recently. Because it's too many, I think I would need a few more days to complete. But after completion, I want to write about what I learned about Hula and nature, which could be very interesting to you.